Students will revel in the creative, detailed writing prompts. Bone chilling to laugh out loud humorous, the starters are springboards for success. Students will be carried to the future, transported to the past and improve their writing skills in the present. This book is written by a teacher for teachers. An invaluable tool to ease preparation of written work. 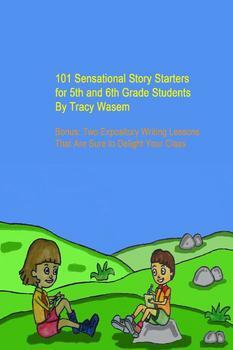 101 Sensational Story Starters for 5th and 6th Grade Students includes two plot synopsis for familiar fairy tales for students to understand the elements of plot. There is rich vocabulary word lists to engage your students to achieve higher standards in their written expression. Two hands on Expository Text writing lessons are guaranteed to ignite even the most hesitant of writers to complete their best work. Infuse entertaining material that will teach lessons required in today's standardized testing world in a manner that children will not forget.